Discussion in 'The Lounge' started by tehsockz, Jan 21, 2013. Im Theo, a 13 yr old and cyclist. Recently, I completed initial work on http://therightbike.com, a new crowdsourced bike recommendation system, as part of my project for eCybermission, an online science fair. Im trying to get as much usage data as I can, and as such would appreciate it immensely if you took just a second to check out the website and give feedback. 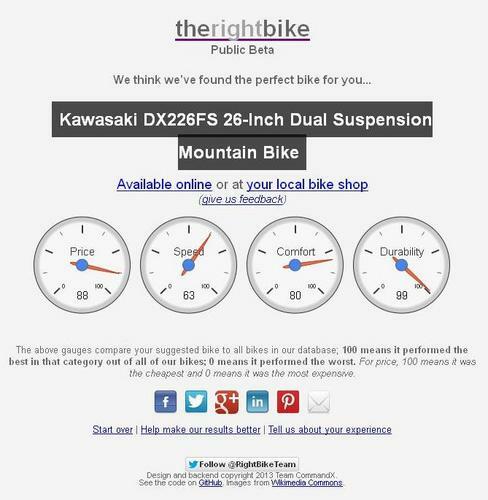 Thanks very much, and please contact me (team AT therightbike DOT com) if you have *any* questions! Holy crap! We got recommended the same bike. We must be twins!